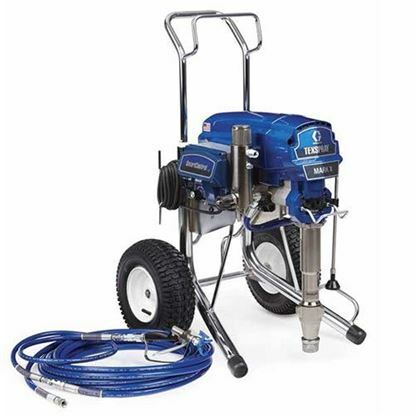 The new Mark X 240 Volt is Graco's largest electric airless/texture unit to date. 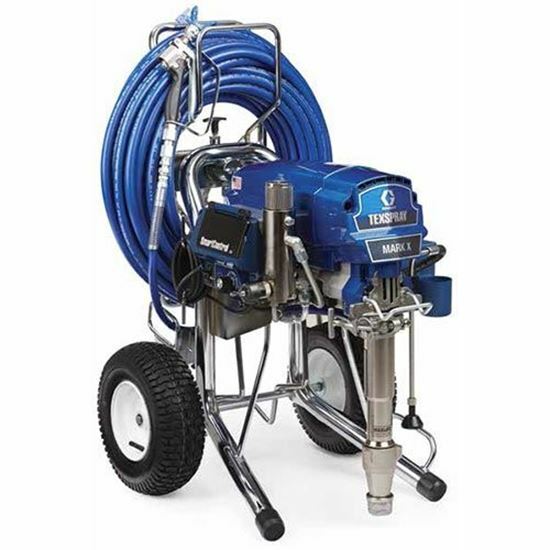 With nearly double the output of the Mark V, it is the sprayer of choice for serious professional contractors who take advantage of the 240 volt power available at the construction site or with a generator. A true powerhouse, it can easily spray skim coat in a Level 5 finish, and drywall mud in an orange peel, splatter or knockdown finish. It can even apply the whole range of primers and paints. Endurance Pump with Max Flo™+ - Long-life Chromax Pump Rod and V-max Blue Packings. New Max Flo+ with Packout Protection provides oversized fluid passages to deliver maximum flow of even the heaviest materials while virtually eliminating pump pack-out. SmartControl 3.0 Offers precision pressure control that delivers a consistent spray fan without pressure fluctuations. 240 volts gives the extra power needed to achieve gas sprayer performance, in an electric unit. Laundry room, kitchen stove outlet, welding outlets in garage, etc.